A tiger that officials say killed 13 people was shot dead in central India over the weekend, igniting a firestorm of criticism from politicians and animal rights activists who said the killing was unnecessary. The operation to find the female tiger, called T1 by authorities and Avni by animal rights advocates, had gone on for months but had intensified after the tiger claimed its latest victim in August. Since then, forest officials doubled their efforts to find it, with patrols, a paraglider, thermal drones, sniffer dogs and even cologne. But late on Friday evening, locals in the west-central Indian state of Maharashtra tipped off hunters that the tiger had been seen near a road. 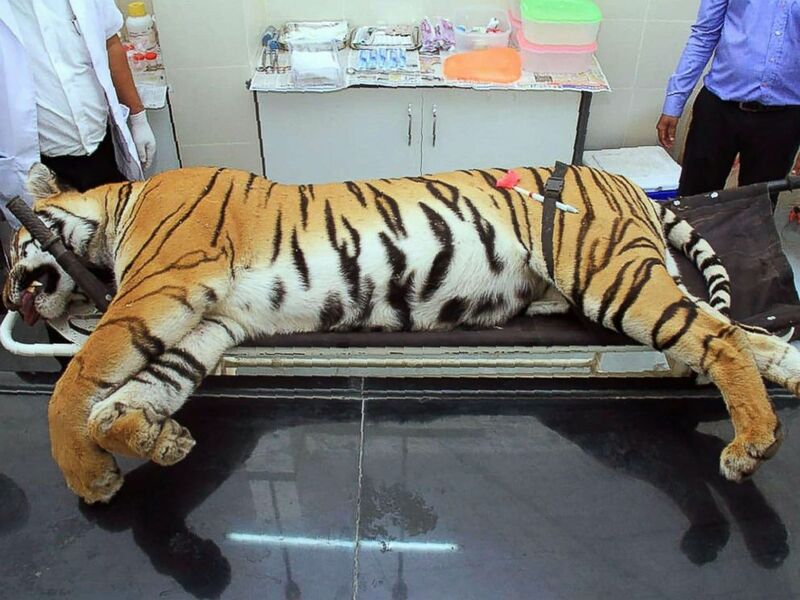 Gorewada Rescue Centre personnel stand near the body of the man-eating tigress T1, known as Avni to wildlife lovers, at a postmortem room in Nagpur, India, Nov. 3, 2018. “It was the location where three [previous] human kills had occurred,” Asghar Ali Khan, a 37-year-old hunter from the Indian city of Hyderabad, told ABC News. Khan was brought in along with his father, a well-known shooter, to work with the Maharashtra forest department. Khan said a team of about 14 was rushed to the spot, near the village of Borati in the Yavatmal district. The team, he said, included a forest official carrying a tranquilizer gun. After hours of waiting, the tiger was spotted by the official, who shot a dart at it, according to Khan. "The moment the dart hit, the tigress was a different animal. She gave a roar, which hit our body more than hearing it," he remembered. The tiger, still alive, then "turned and came for us," he added. That's when Khan said he shot the tiger. "It was in self-defense," he noted. Forestry officials did not respond to requests for comment. But AK Misra, principal chief conservator of forests for the Maharashtra forest department, confirmed the tiger's death to The Times of India. The hunt for the tiger had been has been controversial from the beginning, with activists challenging the forest department in the courts. But the animal's fate was sealed a few weeks ago when the case reached India’s Supreme Court. The court ruled that it would not interfere if forest rangers were forced to shoot the tiger. Sarita Subramaniam, who runs Earth Brigade Foundation, an Indian NGO, has challenged the version of events put out by the forest department. 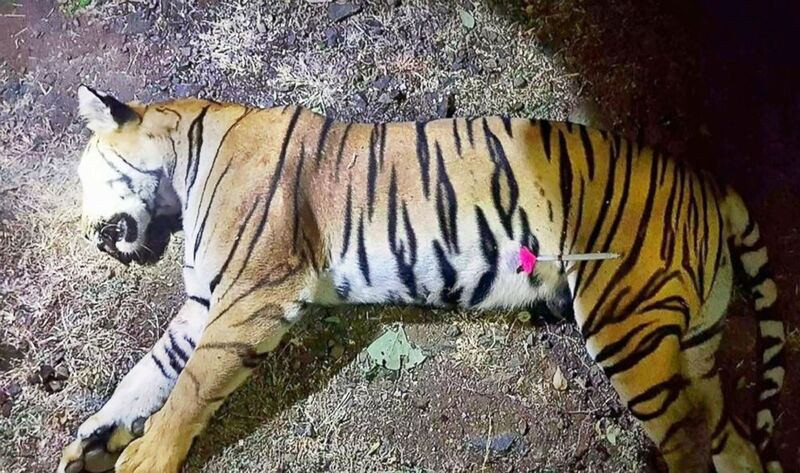 This handout photo released by the Maharashtra Forest Department on Nov. 3, 2018 shows the dead body of the tiger known to hunters as T1 after being shot in the forests of India's Maharashtra state near Yavatmal. She told ABC News from Mumbai, India, that Khan's account left many questions unanswered. "A charging tiger, while roaring, and this guy is shooting, is not likely to face him sideways," she said. "How did the bullet go from the left side and come out of the right side?" She accused Khan of fabricating the facts. "He is lying through his teeth," she said. Villagers in central India told ABC News last month that they lived in fear because of the tiger. "I was returning home from the fields and saw a crowd had gathered here, right at this spot," said Ram Krishna Lonkar. "The tigress had attacked a farmer and killed him." 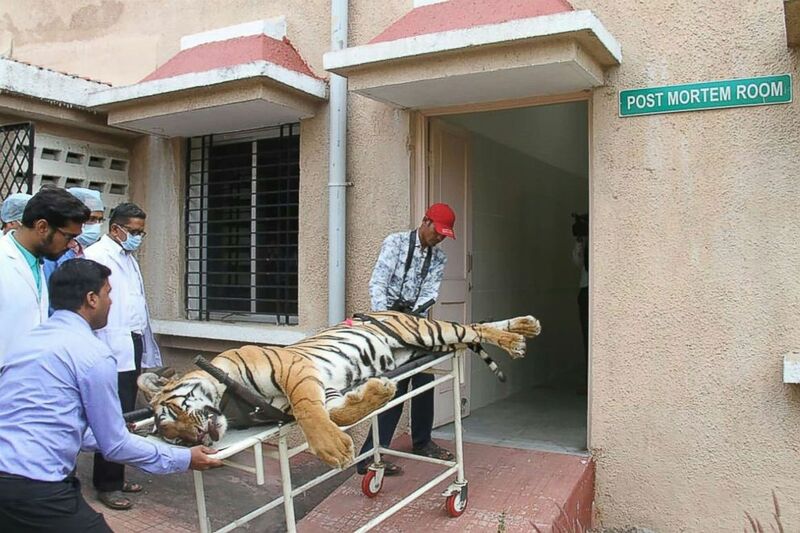 Gorewada Rescue Centre personnel bringing the body of the man-eating tigress T1 into a postmortem room at Gorewada Rescue Centre in Nagpur, India, Nov. 3, 2018. Activists have now turned their attention to the fate of the tiger’s two cubs, who are still in the wild. Some locals believe the 1-year-old cubs may not survive very long without their mother. Not surprisingly, with general elections just a little over six months away, political reactions have come fast and furious. India’s opposition Congress party leader Rahul Gandhi condemned the killing on social media. "The greatness of a nation can be judged by the way its animals are treated," Gandhi tweeted, quoting Indian leader Mahatma Gandhi -- no relation -- and using the hasthag #Avni.